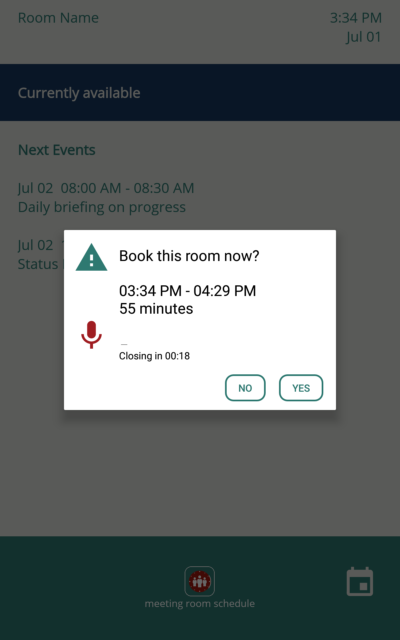 Book Room feature has been enhanced with speech-to-text support in the latest release of Meeting Room Schedule. While booking a room, instead of typing in the meeting subject, you can now record it using microphone button. This article outlines the basic settings and conditions related to the Book Room feature. Once the feature is enabled, you can enter a Pre-defined subject. 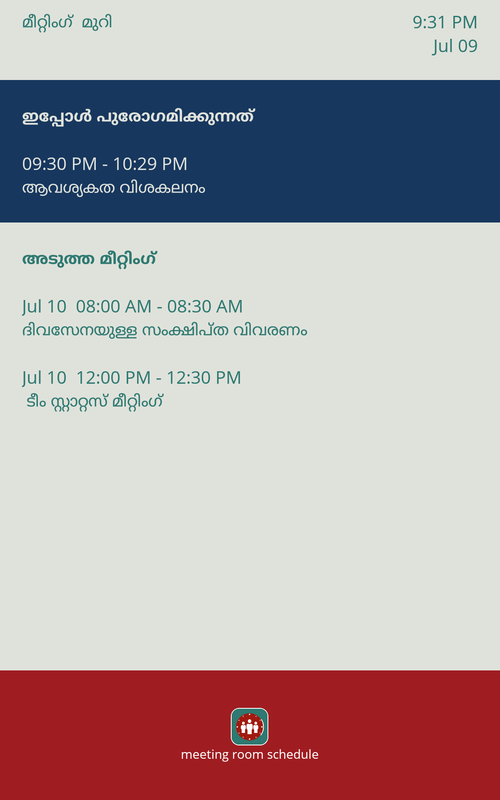 In the below screenshot, the default subject ‘Booked from tablet’ is changed to ‘Booked now’. 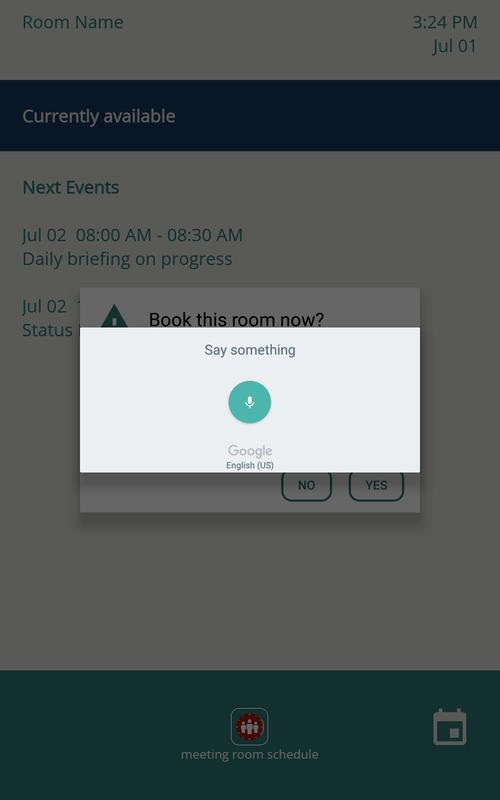 Pre-defined subject is used to configure a default subject while booking a meeting room resource from the Meeting Room Schedule app. The default value of the field is “Booked from tablet”. Maximum length of the subject is limited to 25 characters. The Book room button will be displayed the main screen only if there is no meeting starting in the next 30 minutes. The Duration of booking is automatically calculated by the app. The check-in/auto-release feature is not enabled for meetings booked from tablet. Click on Book Room button once is is available on the main screen (bottom-right). The pop-up will be populated with the pre-defined subject.Click on YES if you do not want to change the subject. 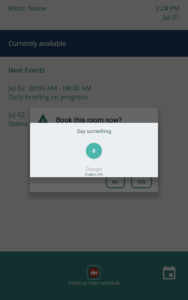 Otherwise, tap on the subject field to type in a new subject and click on YES to book the room with the new subject. Alternatively, you can use the speech-to-text option. Tap on the microphone button and record the meeting subject. The subject is automatically saved when you are using the speech-to-text option. 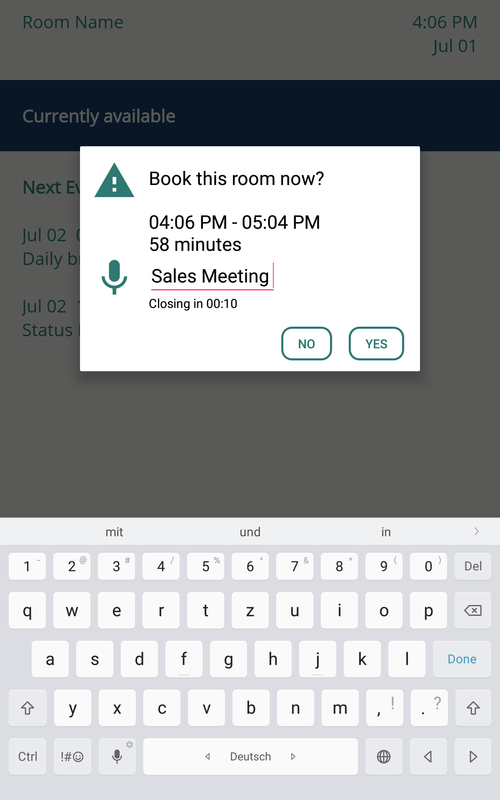 Speech-to-text option supports multiple languages. Please make sure that the desired language is downloaded and set as primary language in Google Voice typing in your device. This setting is device dependent, search for Google Voice typing in device settings and configure accordingly.